Anthony Hopkins working alongside the FBI to catch a serial killer? Hmmmm…… and he’s a psychic? Yeah, I was hooked by the premise of this one. Hopkins plays John Clancy, an actual psychic who assisted the FBI. Though he’s retired after losing his daughter to leukemia, his former handler agent Joe Merriwether (Jeffrey Dean Morgan) calls him to assist with a string of unsolved murders that look to be the work of a serial killer. Though he clashes at first with Merriwether’s partner (Abbie Cornish playing FBI Agent Katherine Cowles) they soon learn that the killer is also psychic and one step ahead of them all the time. Okay, it should come as no surprise that the killer is Colin Farrell. If you’ve got a big named actor listed in the cast and they don’t make an early appearance, 99% of the time they’re the bad guy. This isn’t really a spoiler because when his character is introduced to us it is only as the killer. 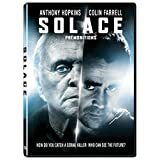 When we find out how he’s choosing his victims and why he’s killing them, Solace turns from a standard crime thriller into a clever, thoughtful crime thriller. The casting was excellent as was the acting, but what I really enjoyed were the visuals. When Clancy was having a vision, the way they showed events that happened in the past and possible events to happen in the future was really well done. In one scene where they’re investigating a woman found murdered in her bathtub, you get to see the events leading up to the murder, but you see the person splitting into multiple versions of herself as the events unfold. In a foot chase a vision of the killer splits into multiple versions, each taking a different path, representing the different choices he could have made as the psychic follows him. I thought it was a very unique way of telling a story dealing with psychics. If something like this has been done before, I don’t remember seeing it, so I really enjoyed this facet of the film. At the end I think Solace works because even though it can be brushed off as a simple crime thriller, it leaves you with something to talk about, but it’s something I really can’t touch on because I think it would be a really big spoiler. It will definitely raise questions about euthanasia and murder.…. Bottom Line: Kind of reminded me of Red Lights from a few years ago, which I really should re-watch. 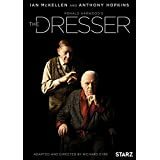 The Dresser was originally a play, and then a film in 1983 starring Albert Finney and Tom Courtenay, and now a TV movie starring Anthony Hopkins and Ian McKellen. “Sir” (Hopkins) is the aging star of a theatrical company who is clearly suffering from some sort of dementia. He was found running half naked through the streets by Norman (McKellen), his “dresser”, the man who preps him for the performances by doing his makeup, getting the costumes ready, and covering up for his employer’s indiscretions. Now, even though they’re in the middle of the blitz, the motto is that “the show must go on”, but how can it if the star can’t be found, and even if he can, will he be able to perform? Norman struggles to keep the troupe equally on track and in the dark as to Sir’s situation and the fate of the night’s production of King Lear. The Dresser was good, but rather slow. It was very dramatic, and a great representation of stage actors, and probably of actors in general. The loyalty of the dresser to the star was admirable though it is hinted that their relationship was not as altruistic as it would seem but did parallel the relationship between Shakespeare’s Lear and The Fool. While the film did focus mainly on the friendship between the two, it also featured the ailing Sir reconciling his relationships with the rest of the cast. From those who love him such as Her Ladyship (Emily Watson) to those who wish to replace him like Oxenby (Tom Brooke) all appear before Sir and Norman. What stood out as the high point for me was Edward Fox (A Bridge Too Far) as Thornton who played the Fool in the play, giving a wonderful, heartwarming speech to Sir near the close of the film. Ironically Fox was in the 1983 version of The Dresser as Oxenby, completely opposite of the gracious Thornton character. The box stated that “The Dresser is a wickedly funny and deeply moving story of friendship and loyalty”, but it was not “wickedly funny”, it did have some subtle laughs, but was really all drama, and that is what disappointed me. Not being familiar with either the play or the original film, I was half expecting some sort of theatrical shenanigans to take place, but they didn’t. Ah well, it was still enjoyable enough, though not what I expected. Bottom Line: Naturally both Hopkins and McKellen gave excellent performances and made the film worth watching. Sequels are rarely as good as their originals, but that doesn’t mean they can’t still be fun. Tonight I watched RED 2, and must admit it was a lot of fun. Highly enjoyable but similar to my thoughts on The World’s End, it suffers from coming too late. Everything that clicked just right in the first film was almost carbon copied into the second film, but copies always lose a bit of detail. 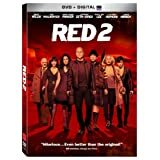 I know they say “if it isn’t broken, don’t fix it” but RED 2 didn’t really do anything different from RED. I really enjoyed the first one, in fact I think I may have ranked it as my favourite film of 2010, so maybe I expected too much from the sequel. Frank Moses (Bruce Willis) is still retired, but now trying to live a quiet domestic life with Sarah (Mary-Louise Parker) when Marvin (John Malkovich) contacts him. During the Cold War, Frank and Marvin worked on an operation called Nightshade that involved smuggling a nuclear weapon into Moscow piece by piece for reassembly. This information was somehow publicized by Wiki-leaks and now various governments are after the pair in hopes of finding the hidden weapon. Russian agents are after them led by Frank’s former flame the femme fatale Katja (Catherine Zeta-Jones); MI-6 is after them, and have hired their friend Victoria (Helen Mirren) to kill them; and after failing to stop them themselves, the Americans led by Rogue Agent Jack Horton (Neal McDonough) have hired Korean assassin Han Cho Bai (Byung-hun Lee) to kill Frank and Marvin too. Frank just wants to keep Sarah safe, but she wants to be involved and help Frank. She’s also a bit jealous after learning of Frank and Katja’s past. The trio team up, betray, and are betrayed by everyone on the board as they dig deeper and eventually find the path leading to Dr. Bailey (Anthony Hopkins), who created Nightshade and is being held in an asylum by the British with his memory being suppressed by drugs so he can’t speak of the weapon. Bailey gets broken out, they all head to Russia to find the bomb (which is hidden in the heart of the Kremlin, because it’s the one place the Russians would never look) dodging bullets all along the way. The action was great, the humour was sharp and the acting was good. Helen Mirren was of course excellent and really shines in these movies because you don’t expect her to be in them. Mary-Louise Parker was good, but Sarah this time around had lost a bit of her vulnerability and some of her innocence, two things that really drew me to the character in the first film. Malkovich’s Marvin was funny again, but not as paranoid or crazy as round one. Actually Anthony Hopkins was a little crazier than Marvin which was kind of interesting. Bruce Willis’ Frank still delivered a lot of the action, but even acknowledged in the film that he was getting older during his fights with Han. In my opinion Byung-hun Lee (Han) really stood out well amongst a stellar cast of actors. He may be best known as Storm Shadow in the G.I. Joe movies, but I’ve been impressed by him since I saw him in The Good, The Bad and the Weird, and Masquerade: King of Facade. He did not disappoint here either; bringing a bit of class, a lot of action and dry humour to his assassin character. RED 2 was a lot of fun, in a lot of ways I suppose it is a much lighter (and much better) version of The Expendables. We’ve got recognizable faces, Oscar nominees, Oscar winners, Dames and Knights, delivering all the action, car chases, and explosions, the screen can handle. Yes, similar to The Expendables, only this time we have much better actors and a better story. When I heard about Hitchcock it immediately went to the top of my “to watch” list. It was a film that I wanted to see in theatres but I don’t think it played anywhere short of a half hour drive away. I fear now that after seeing it myself, it would have been a repeat of the J. Edgar fiasco. I would have enjoyed it, as I did tonight, but I’m doubtful that any of my old movie going friends would have. I’ve learned not to make suggestions anymore. Hitchcock tells the “behind the scenes” story of the famed director’s struggles to make Psycho. Touching on the problems with the studios, the censors, his cast (particularly his leading ladies) and of course his wife Alma Reville who assisted writing and editing some of “Hitch’s” most famed works. There were hints of infidelity on Alma’s part and also hints that she was more of a driving force to the great director. Their relationship was played out very nicely by Anthony Hopkins and Helen Mirren as the movie is more about Alfred and Alma than “Hitchcock” himself, or his films. Also starring Scarlett Johansson playing Janet Leigh, did an excellent job especially in the recreation of the famous “shower scene”. I was quite impressed by the acting overall but I always find it curious to watch actors that I know playing the parts of other actors, nested in their roles acting in another film. I often wonder when actors play “real” characters (not just playing other actors, but anyone of any public fame) if they are acting, interpreting or just imitating their subjects. A good part of Hopkin’s performance was the makeup, the voice, and the mannerisms, which I suppose is Hopkins doing a Hitchcock “impression”. The film was enjoyable enough but I guess my complaint is that the film didn’t really do anything. Was it just a very trimmed down look at the making of another movie? 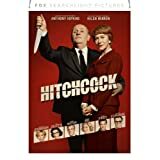 Hitchcock really just seemed to scratch the surface of some truly interesting subject matters, by showing us how directors have to sometimes fight for their films to be made, but it also shied away from any kind of depth. I guess the “tell” in this one is that minutes after watching Hitchcock, I put in (and thoroughly enjoyed) Psycho. Simply amazing, an example of true horror and suspense, with Hitch at his peak. Loosely based on Robert Bloch’s pulp novel, which was itself loosely based on killer Ed Gein, Psycho presents us with the tale of Marion Crane — who, in a moment of madness, steals forty-thousand dollars. Running scared, Marion checks into the out-of-the-way Bates Motel, and the rest is cinematic history. The suspense and horror are heightened by the excellent choice to use black and white cinematography and Bernard Herrmann’s often imitated but never duplicated score making Psycho about as close to perfect as a film can get. Anthony Perkins, Janet Leigh, Martin Balsam and Vera Miles give great performances rounding out a night at the movies that will make you think twice before showering. There we go, a 2 for 1 of movie reviews tonight, as I’ve been away from movie watching for a few weeks now. I’ve been hooked on TV lately; pushing my way through disc after disc of Castle (which I got hooked on when I stumbled upon the first episode on TV but quickly grew tired of commercials and waiting a whole day for the next syndicated episode); stressing out about the last few episodes of Walking Dead (Season 3); and anxiously awaiting the return of the Doctor.